Baskets make wonderful table centerpieces, and they make great gifts, for holidays, birthdays, or housewarming. You can fill them with just about anything. This Christmas basket starts with a bed of evergreen boughs. 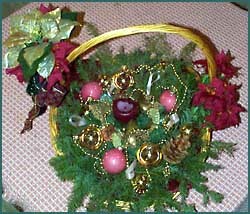 Fill the basket with ornaments, ribbon, pinecones, strands of beads or garlands, etc. The basket handle can be decorated with bows and Christmas floral's. The height of this basket made it a great coffee table decoration, and the handle was high enough to place a candle in the center. An autumn basket makes a lovely centerpiece for any table. Basket arrangements like this are especially nice as centerpieces for your Thanksgiving dinner table. They generally set on the table, so guests can still see each other from across the table. Start with a bed of straw or raffia. Fill the basket about 2/3 of the way up, so your basket looks full. Place larger items in the basket first, then arrange the smaller items around them. Finish with the smallest or most delicate items (ifs, wheat, etc.). 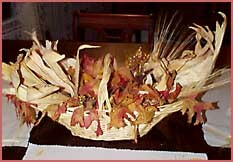 This basket contains several ears of mini-corn with the husks still on, small gourds and pumpkins, some silk autumn leaves, dried yellow mums and lots of wheat and wild grasses.